Students in the Evolution Zone were particularly interested in the scientists’ research. The discussions in the live chats explored the work of all the scientists, with conversations about animals, life, humans, fossils, birds, and other species. 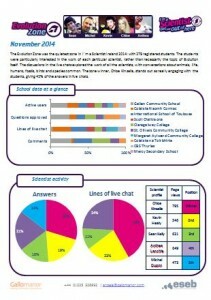 The zone winner, Chloe Kinsella, stands out as really engaging with the students, giving 42% of the answers in live chats.